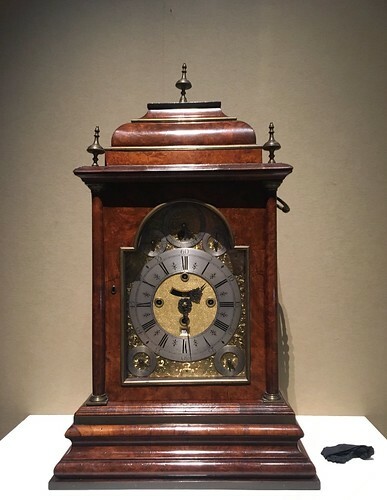 In the recent exhibition of the Lord Harris Collection at Bonhams, there were a number of Huguenot clocks. Perhaps the most impressive was this eight day musical cloak by Claude DuChesne (c1725). It's four-train, quarter-striking with a verge escapement. Music is played on one of six interchangeable pinned barrels, stored in a drawer in the base.